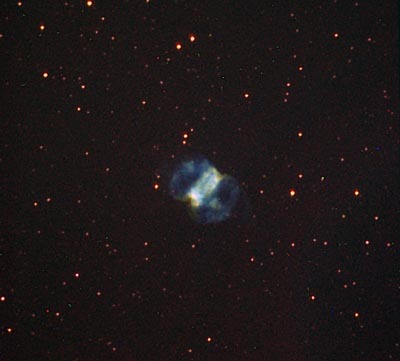 The Little Dumbbell Nebula. Image courtesy Richard Crisp. The Little Dumbbell Nebula (M76, NGC 650 and 651) is a planetary nebula in the constellation Perseus that resembles, but is smaller and fainter than, the Dumbbell Nebula. It is also known as the Cork Nebula, Butterfly Nebula, or Barbell Nebula and was discovered by Pierre Méchain in 1780. The bright bar-shaped main body (measuring 42" × 87"), is probably a slightly elliptical ring seen edge-on from only a few degrees off its equatorial plane. This ring seems to be expanding at about 42 kilometers per second. Along the axis perpendicular to the ring plane, the gas is moving out more rapidly to form lower surface-brightness wings (157" × 87"). Finally, there is a faint halo covering a region about 290" in diameter, consisting of material that was probably ejected in the form of stellar winds from the central star when it was still in its red giant phase.